The Nigerian Television Authority is one of the parastatals of the Federal Ministry of Information, established by the Nigerian Television Act Cap 24 of 1976. NTA is the National Broadcasting Network for Nigeria expressly mandated to provide as a public service in the Interest of Nigeria, Independent and Impartial television broadcasting for general reception within Nigeria and beyond. As the largest network in Africa, NTA now serves as the medium for the African content to tell the African story. The Authority’s programming has started to re-enforce the enthusiasm the blacks in diaspora have for Nigeria and African culture while correcting the negative perceptions of the black race. It is partly funded by the government, partially commercialized but operates strictly within the enabling public service guidelines. NTA seeks to serve as a tool for national integration. Also the broadcasting mandate of NTA has been expanded from only broadcasting to Nigeria, to broadcasting to both Nigeria and the world at large. The NTA performance can be measured against the provision of this charter. To provide excellent television service worldwide and project the true African perspective. To erect, maintain and operate transmitting and receiving stations. Plan, maintain and co-ordinate the activities of the entire television network. Ensure the establishment and maintenance of standards and promote the efficient operation of the entire system in accordance with national policy. To establish and operate a formula for sharing funds among stations. To act as liaison between federal government and the operators. To establish such number of stations as it may consider necessary from time to time. To enter into arrangement with any person or any authority for the purpose of obtaining concessions, licenses, privileges and other rights. To manufacture, produce, purchase or otherwise acquire films, gramophone and other mechanical records and materials and apparatus for use in connection with the broadcasting services. To provide other persons with and receive from them materials to be broadcast. To organize, provide and subsidize for the purpose of broadcasting, educational activities and public entertainment. To collect in any part of the world and in any manner that may be thought fit, both news and information and subscribe to news agencies. To publish printed matter that may be conducive to the performance of any of the functions of the Authority. To carry out such other activities as are necessary or expedient for the full discharge of all or any of the functions conferred on it by law. NTA operates Standard-Definition Television (SDTV). This system uses a resolution of signal type 576i Phase Alternating Line (PAL) and 4:3 aspect ratio. NTA does coverage of live events using its Outside Broadcast facilities. These enable NTA produce and transmit live events from within Nigeria and beyond. This service is available for customers. Content, however, must strictly conform to the provisions of regulatory authorities and NTA in-house policies. This is usually a paid-for service. To enable it do a professionally acceptable live coverage of events, customers are expected to contract NTA at least a week before a simple event, and several weeks before a complex one. This enables NTA crew plan for the coverage ahead of time and NTA Legal and Marketing work out new timings for displacements of sponsored programmes. NTA produces its broadcast schedules on a quarterly basis. The document gives day-by-day breakdown of time slots for programmes, types of programmes, their running durations and frequency of occurrence. The schedule is usually ready at least a month before the commencement of a quarter. Customers’ requests for quarterly sponsorships of programmes should reach NTA at least two months before the beginning of the quarter. This leaves enough space for reviews and adjustments before the schedule is declared ready for implementation. It also gives enough time for NTA channels to use the approved schedule in drawing up theirs. Customers could also buy airtime for adverts. Slots for these vary from 15, 30, 45, to 60 seconds. Each is charged according to its duration, chosen time on schedule and number of times it would play out. These ads could be corporate, service, product, personality or event promos. Charges for air of ads are contained in the NTA National Rates Cards. NTA produces and transmits short-format social service messages in the forms of jingles, announcements and short documentaries and dramas. These are done as part of the organization’s corporate social responsibility. No sponsor pays for news and public service programmes of NTA. However, corporate news, news of special interest and infomercials are paid for based on the provisions of the NTA National Rate Card. To remain a world-class broadcaster, NTA ensures that content on its various channels pass through rigorous processes of production. NTA programmes are required to meet laid down criteria in terms of video and audio qualities as well as other production and ethical values necessary for attaining world best standards. Quality Control mechanisms are put in place at various levels to ensure strict compliance. These requirements are also expected of independently produced programmes before they are cleared for air. Customers are expected to monitor and track their contents scheduled to air on the NTA Network or any NTA channel and could lodge complaints whenever failures are recorded. In addition, NTA has a team of monitors whose activities are coordinated by its Research, Development and Monitoring Unit. Reports from these monitors reach Management on a daily basis. Response to failures and related issues is prompt and decisive. These publics are the reasons for NTA being the largest network in Africa. At the forefront of the public are NTA employees who corporately contribute as a team in making the organization discharges its mandate. In return, the welfare of the staff is catered for according to laws establishing the organization. NTA Contractors are engaged to provide products or services based on needs. Programs guests and resource persons are invited to make contributions on a number of NTA Programmes. Most resource persons and guests contribute to NTA Programmes without demanding for any form of pay. Artistes and special appearances, however, are paid based on the rules of engagement. NTA respects the rights of all persons. People with special needs are adequately catered for in all its programming. Their plight is constantly reflected in our various programmes and our news reports. UN Days for activism on the plight of these groups are elaborately hyped, covered and popularized. NTA is always at the forefront in setting the agenda for discussion on issues affecting them. We remain trusted partners for government agencies and NGOs championing the course of these vulnerable groups. NTA seeks to serve as a tool for National integration. Improve the life of the Nigerian through a wide choice of customer friendly, value added programmes designed to impact positively on his/her social, cultural, economic, political and technological thinking. Enrich national output through programmes that foster the spirit of hard work and productivity. Provide leisure, relaxation and rest through Entertainment programmes. Extend clean and clear Television signals within reach of every home in Nigeria. Provide Nigerians within and outside Nigeria with programmes of reliable authentic coverage and analysis on contemporary issues of local, National and International events. NTA operates a network of over a hundred (100) stations located across the country, in ten (10) operational up-link Network centers and Abuja as Headquarters. Also in Abuja is an International station, NTA International. There are also eight additional digital channels. These are NTA News24, NTA Sports, NTA Entertainment, NTA Knowledge, NTA Hausa, NTA Yoruba, NTA Igbo and NTA Parliament. These together form what NTA has as NTA Multi-channels. These publics are the reasons for NTA being the largest network in Africa. At the forefront of the public are NTA employees who corporately contribute as a team in making the organization to discharge its mandate. In return, the welfare of the staff is catered for according to laws establishing the organization. NTA Contractors are engaged to provide products or services based on needs. Programs guests and resource persons are invited to make contributions on a number of NTA Programmes. Most resource persons and guests contribute to NTA Programmes without demanding for any form of pay. Artistes and special appearances, however, are paid based on the rules of engagement. World-class Television service delivery from the NTA in terms of content, quality of reception and standard of programming and programmes. Decency, good taste and good moral values in NTA programmes. Accurate information, qualitative, educative and entertaining programmes. Be fully acquainted with the Service Charter of the NTA. Make all enquiries in a responsible manner. This depends on the intent of the user. NTA signals carry programs across a number of platforms: free-to-air, terrestrially by feeds and on satellite. Except for “Feeds”, viewers can access NTA programmes on any of the aforementioned sources free of charge. Subscription charges may be required for NTA’s digital channels on Startimes and DSTV. Understandably, these charges are paid to either Startimes or DSTV as the case may be. `Feeds’ are signals made available only to NTA’s network of stations for open-broadcast. Some non-NTA stations could agree with NTA to get signals of live events, a good example is a presidential address. Costs for adverts placements, programs sponsorship, News of Special Interest, Live Coverage of events are contained in NTA Advert/Programs Rates. This is available in all stations as well as in Marketing, News and Programs Directorates as well as NTA Corporate Affairs Unit. Capacity Building by training and Retraining of Staff. Provision of relevant working tools and equipment. Recognition and reward of Hard work and diligence. The dream of NTA is “To be a World-Class Television Network”. External customers of NTA who feel aggrieved can lodge complaints by contacting any of the above persons. Note that complaints should be directed to the appropriate departments. Other than News, Programmes and Marketing, all other types of complaints should be directed to either the SERVICOM Unit or NTA Corporate Affairs Department. Where complaints are not promptly treated, the attention of the SERVICOM Unit should be drawn. Complaints and grievances from staff are treated according to the provisions of the NTA’s Admin Manual which are as contained in Nigeria’s Public Service Rules. In the event of service gaps, where a customer has a complaint about service rendered, if investigated and found to have merit, through the “right of Hearing” the “Make do transmission or “Repeat Transmission” is rendered to the customer. *Where a paid-for Programme is displaced by an event of National significance e.g. Presidential event or broadcast, a suitable slot will be provided. Fill the Service card provided by the Service Unit. Drop in the Suggestion Box placed at Strategic points. Fill a Complaint Book at the Service Unit. This Charter is subject to review periodically. 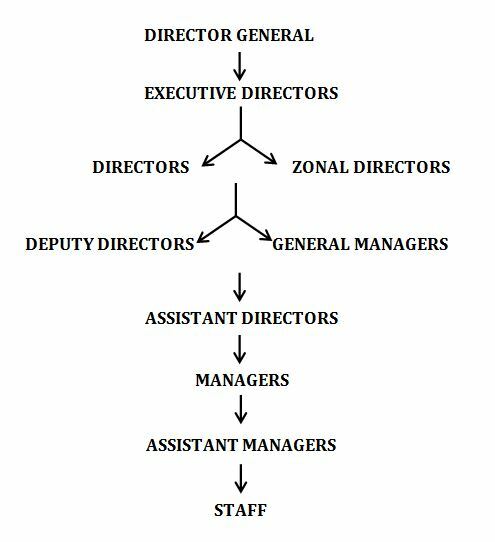 The Director General as the Chief Executive, co-ordinates the activities of all Directorates.